This blog is going to show you how to deploy an additional “plugin-in/service” in stand-alone mode without the need to install the patch installer on each server. The current issue with the WinCollect install is that it only installs Windows Event Log and File Forwarder services as part of the baseline install. Therefore if customer wants to collect DHCP logs in a stand-alone deployment they would need to install the WinCollect Agent and then install the Patch Installer and then either use the Configuration Console or modify the Agent-Config.xml directly. In this blog I will discuss how to take the Patch installer out of the equation and also how to make changes using templates so you won’t need to edit the Agent-Config.xml directly. Customer wants to deploy WinCollect in stand-alone mode and would like to collect Windows Events along with DHCP server logs. They would like to keep all the configuration generic so they don’t have to change it for each server they install. NOTE: To access the required service .dll’s, and to create the template, you will need to install the WinCollect Configuration Console via the patch installer. Recommend installing this on your laptop or on a test machine so that you can get the correct dll’s and Agent-Config.xml format. 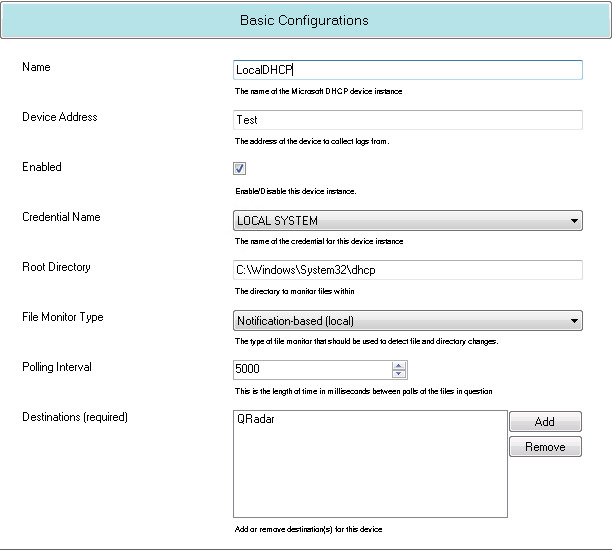 NOTE: If you want to use the Configuration Console you need .NET 3.5 installed. NOTE: Since we want to make the configuration generic I replaced the “Test” for DeviceAddress and RemoteMachine with %computername%. The Configuration Console won’t accept %computername% as a valid hostname. We also need to tell the Agent where we want to send the events for this log source to. So we need to bind the Log Source name with the destination name, which is configured in the PayloadRouter service. In this example we can see routes for both the event log and DHCP collection. Finally to provide the Agent the DHCP code base we need to gather the DeviceMicrosoftDHCP.dll from the c:\Program Files\IBM\WinCollect\bin folder where you installed the patch installer. Now that you have both the .dll and the template file you can push this out to any agent where WinCollect 7.2.8 is installed in stand-alone mode. The WinCollect Agent will check the patch folder every 3-5s and will see template file, add the contents into the Agent-Config.xml and then restart WinCollect. You will now see an additional patch_checkpoint folder and a new Agent-Config in the \WinCollect\config folder. 10-30 09:12:40.680 INFO  Device.Service.WindowsDHCPDevice : Microsoft DHCP Device Service: Overriding thread pool type with type AdaptiveThreadPool. 10-30 09:12:40.695 INFO  Device.Service.WindowsDHCPDevice : Microsoft DHCP Device Service initialized. 10-30 09:12:40.711 INFO  Device.WindowsDHCP.WindowsDHCPDeviceReader.DHCPSV : Opened file C:\Windows\System32\dhcp\DhcpSrvLog-Tue.log. 10-30 09:12:40.711 INFO  Device.WindowsDHCP.WindowsDHCPDeviceReader.DHCPSV : Opened file C:\Windows\System32\dhcp\dhcpv6srvlog-tue.log.